URGENT NOTICE: We have been monitoring the CXT online software for about a year now and it hasn't been as efficient as we hoped for. Therefore we have sent a list of upgrades and changes to CXT in hopes they can improve the software to best fit our needs and yours. As of March 1, 2016 our online tool will be suspended until CXT has made the upgrades we desire. Below are the instructions for you and your team to register in order to use our online order feature. Each member will need to create their own username and password so we have the proper point of contacts when an order is placed. 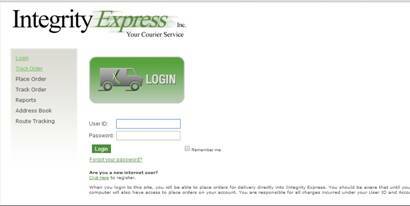 Follow this link OR Login on the "Online Order" page, located directly at the top of the page. You will see this page below. When prompted to, fill in the necessary information. We will approve your username and then you will be able to log in and see reports, place orders, etc. 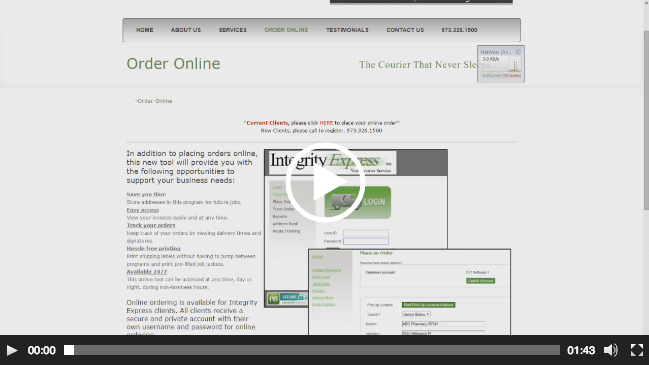 When placing orders online, it is imperative that you print an “Integrity Express Ticket”. 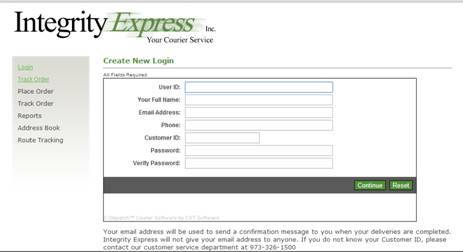 This is NOT a label for your package, there is a separate option for “Integrity Express Label” that you can use for your packages. This is the ticket the driver uses to get a signature on. You will not be left a copy at pick up, so if you need a copy as well, you would need to print two tickets. You can also print a receipt once you place a job. You will get a confirmation email that your job was placed. WE WILL NEED TO APPROVE YOU FOR THE FIRST TIME, WHICH MAY TAKE UP TO 24 HOURS FOR US TO RECEIVE YOUR REGISTRATION. If you see the below error message, check your delivery times. They may be out of the delivery parameters. Our system requires to set an "End of Day" time, which is set to 5pm EST.